No matter how good the team is, every project needs clear priorities to achieve its potential. When you have many stakeholders with different views, this can be a challenge. On top of that, anyone familiar with risk management will tell you to expect a fair number of surprises along the way. With the right strategy, this is all manageable. You can save a lot of time if you go into a project knowing the technology, processes and subject matter. That means research the industry broadly with training and reading materials. It also means asking team members about their work. You can use your time in the Starting Up phase to find out what stakeholders most value. With all this specific knowledge, you’ll find it much easier to prioritise work. A project backlog is a list of features or technical tasks that the project needs. It’s best to create this as early as possible, and update it when necessary. The team maintains the backlog, which can take any form. It can be a series of post-it notes or part of the Project Initiation Document, for example. The one thing to be aware of is that items that don’t contribute to the project's goal don’t belong in the backlog. There’s a reason this is one of PRINCE2’s core principles. To prioritise work, you have to itemise it. With the project work broken down into manageable chunks, attach finish dates to them. This will give the project a sense of direction. To make it easier for the team, make the project schedule visible to everyone. That way, everyone can understand your vision and their duties. It’s tempting to always focus on the most immediate task. But remember that not every task is business-critical. So with that in mind, ask yourself if a task is urgent, important or both. If you’re not sure, refer to the Business Case and what stakeholders have told you they most value. Use this information to clarify the larger project goal. With that, you can understand how important a task is and prioritise it. Try delegating urgent not important tasks to people who see the task as important. For example, you can delegate specialist functions like reporting. These tasks might be more important to Project Support members who have a passion for them. The best way to prepare for uncertainty is with effective risk management. This requires flexibility and adaptability. Know that priorities change, but stick to the business case and scope so you’re not being pushed in the wrong direction. Discuss the stages with the project team and get feedback during meetings. 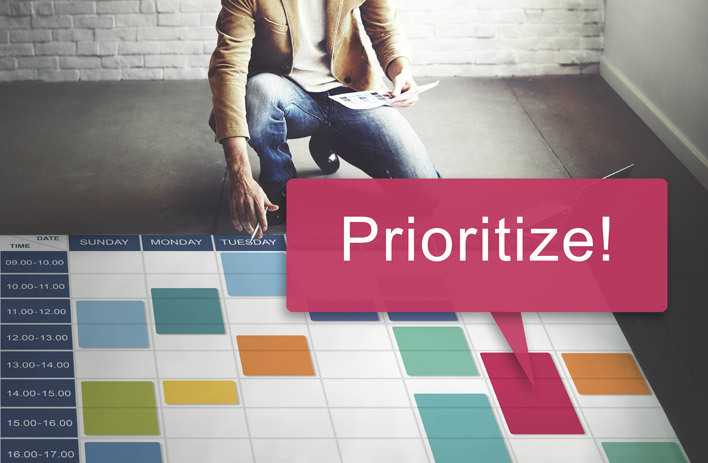 This will help you prioritise work all throughout the life of the project.